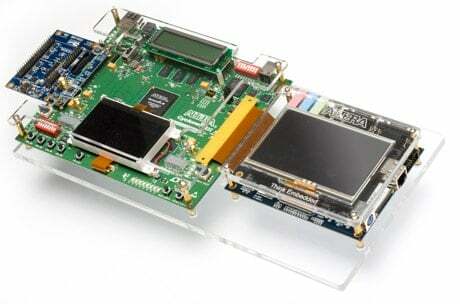 An embedded system is the one that “embeds” a Microcontroller unit (MCU) into the electronics design. Usually most everyday products that we use like refrigerators, automobiles, washing machines, microwave ovens and even your TV uses microcontrollers in them. The functionality of such an embedded system design can be most often controlled by “firmware” which is the software running inside the microcontroller. So the biggest advantage about embedded systems development is that most of its functions are software controlled and can be changed easily without much work lost in re-designing the hardware. TronicsZone holds over 15 years of experience working on embedded systems design using various 32/16/8 bit microcontrollers, FPGA & DSPs. Embedded Design is by nature a collective team process demanding technical and engineering skills such as system design, electrical design, cable design and manufacture, software development, testing, and quality management. As a leading embedded design company, we only employ highly skilled and talented engineering team for partnering with our clients to know their actual demands so that we can provide them with top-notch support, no matter it’s just offering firmware development, or rendering full-turnkey embedded system design services. TronicsZone provides proven and highly reliable and embedded system design services for an extensive array of standard microcontroller & System on chip (SOC) platforms. Our solutions vary from Linux-based embedded OS to Windows; from regular systems & boards to specifically designed systems & boards. For over a decade, we are producing next-generation system design and engineering solutions to support our clients to overcome their business hurdles. We have been acknowledged as an innovator in safety-critical embedded systems designing and development for medical devices, aircraft components, automotive electronics industries and much more. Since the inception of our firm, we emphasized our efforts in delivering highly productive and effective services to make our clients reach unmatched satisfaction.